Isn’t She Lovely… Isn’t She Wonderful! 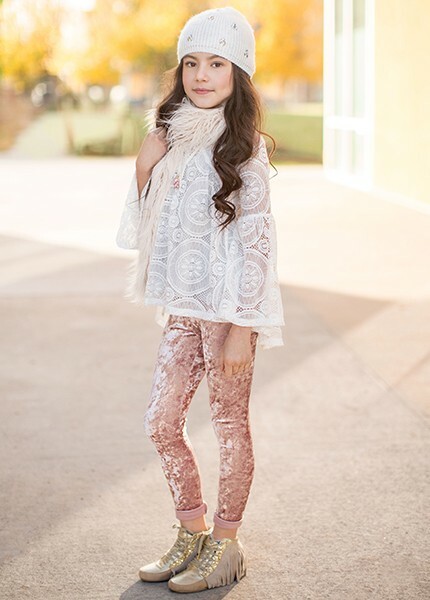 We know where to find the cutest little girl clothes at SugarBabies Boutique! Unique and precious items your little lady will adore! What a beautiful way to announce the addition of a sweet precious girl into the family. Finish off the look with newborn baby moccs. Freshly Picked Bow Mocc in Platinum are shown here. 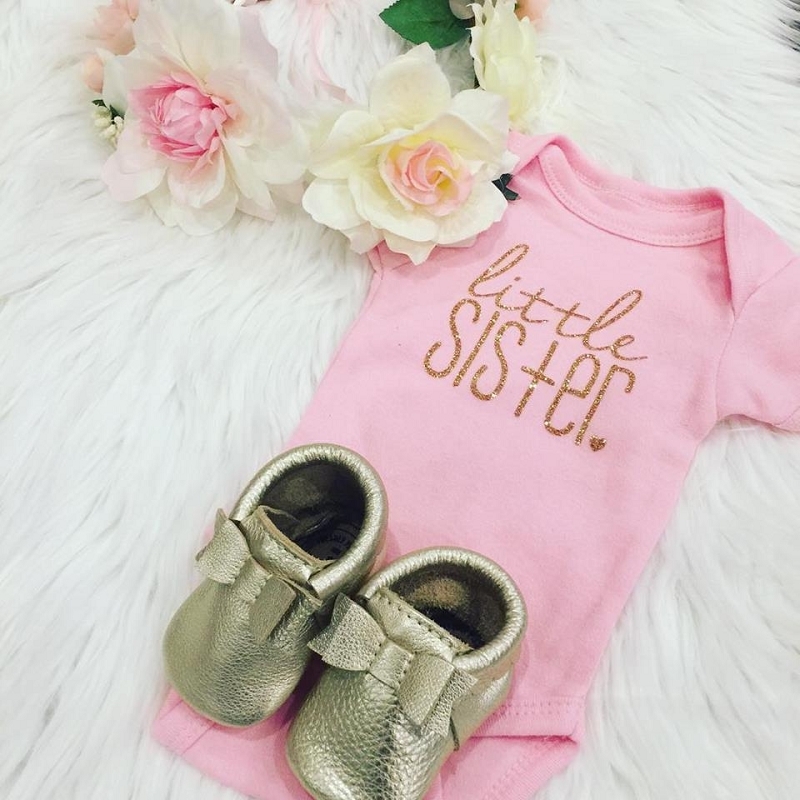 The Little Sister Onesie is available in Pink with Gold Glitter and White with Silver Glitter. Don’t forget coordinating Big Sister (see below) or Big Brother Tees for memorable photo ops! 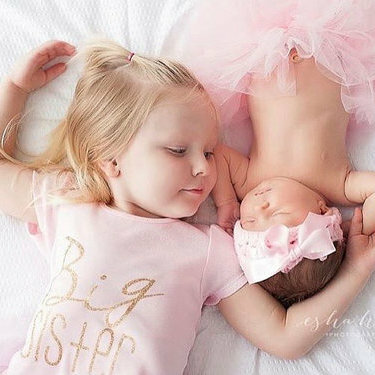 Sweet sibling photos are priceless! ??? Fluffy tiered tulle tutu makes the perfect photo prop for any new girly-girl. Be sure to add the coordinating crown for the perfect look! There’s nothing sweeter than newborn photos with the perfect outfit. Perfect for those born to shine, the Aden + Anais 100% cotton muslin dream blanket gets a metallic makeover with new prints that are as soft as they are shimmery. Made with four layers of breathable muslin, the dream blanket’s uses go beyond cuddling, as it also makes a snuggly surface to lay your little one on no matter where the day takes you. Shop all our blankets to find the perfect one! Mud Pie has done it again! Pink jersey sleeveless top with sequin and silver metallic linen “TOTAL doll BABY” appliqué features silver foil dot mesh overlay and attached silver foil dot ruffled mesh flounce. Arrives with pink jersey bloomers. Complete this sweet look with the Glitter Knotted Headband. Just timeless!!! This delicate rose print is adorned with soft ruffles and bows. The vintage rose footie is 100% cotton with an asymmetrical snap closure provides for easy changing. Includes a matching hat. If roses are a little too much for your style, you cannot go wrong with a solid colored ruffle footie from Kickee Pants in Creamy White or Soft Pink. You and your baby will love the oh-so soft bamboo viscose… and did we mention they are simply gorgeous!!! A must have for your sweet girl! Pair this adorable cotton screen print (with glitter!) 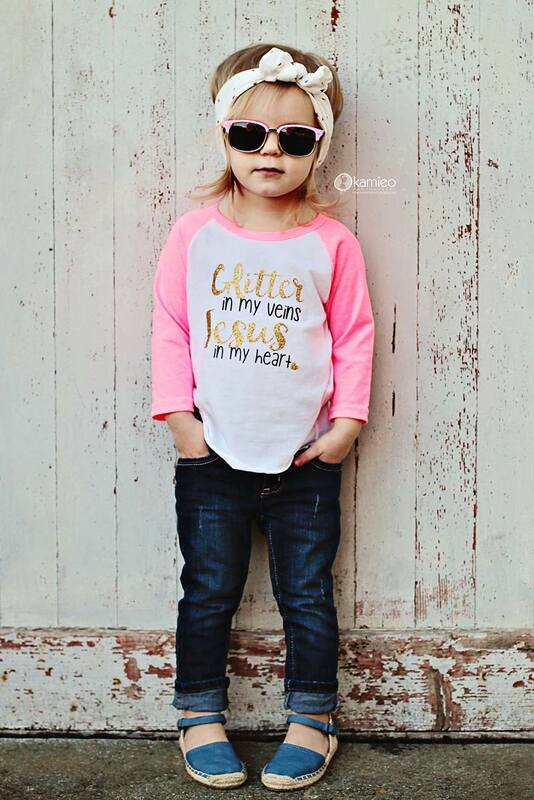 baseball tee with your favorite accessories like Babiators and a Baby Bling headband to complete the perfect look! Are you having fun yet??? There is so much fabulous stuff to share here. The DockATot is genius! Your baby girl can have safe tummy time, play time, and nap time. This Fun Flamingo DockATot cover from Blush + Blue is just that… FUN! This cutie pie is wearing a Baby Bling bow knot headband and a Juliet Cutie Clip from Ryan & Rose. Did someone say more glitter??? That’s always a good idea! ? Your little lady will feel like a star in this gorgeous tutu set. Pair with some metallic shoes to glitter from head to toe! When your young lady isn’t so little anymore… Joyfolie designs give your girl that couture look with age appropriate style. These super comfy crushed velvet leggings are the perfect staple for a fabulous and easy everyday piece. Then pair with boots for an effortless statement! Find more gorgeous items for your lovely little lady! Bum Genius Martin – A Review!